Winslow is a beautiful, modern four-year old registered haflinger gelding sired by the well-known stallion, Walzertakt. Winslow was broke as a two year old but not kept in continued training and was allowed to slowly mature out on pasture. As a four year old now, Winslow has just completed 3 months of professional training. In his training, he encountered a variety of experiences and obstacles, including bridges, tarps, traffic, etc, to aid in confidence building and desensitization. He was ridden daily by children and adults alike and his trainers had nothing but good things to say about his demeanor and work ethic. Winslow is patient in the crossties and a gentleman about being harnessed or saddled. He stands well to be mounted anywhere and basically does what is asked of him without a fuss. He has a good solid whoa-walk-trot and is working on mastering his canter. He has had extensive experience on the trails and we are now starting to work him in the arena for show ring etiquette (bending/transitions/etc). He clips, loads, bathes, trailers, etc. He is good in the pasture with other horses and has no vices. 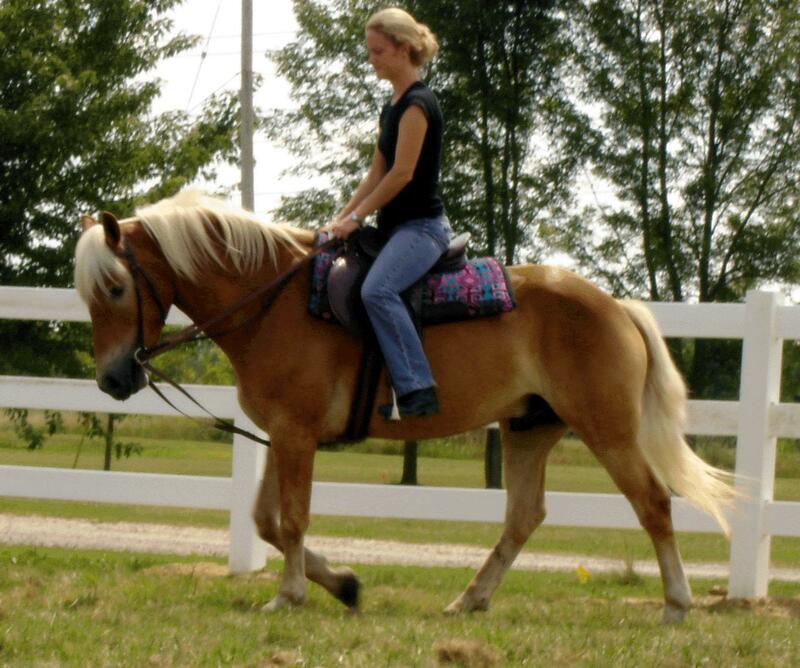 True to his haflinger nature, Winslow is a very sweet and personable gelding that loves attention. He will come and greet you in the pasture, wait for you at the gate and follow you everywhere you go. He merely desires your approval and your companionship. Once bonded with his owner, we feel that Winslow would be the kind of horse that would walk through fire if his owner asked him to–he’s that devoted and strives that hard to please you. Winslow is for sale as we breed haflingers and do not have a spot on our show string for geldings. We would like to match him up with his forever home. We feel Winslow would be very suitable for an advanced beginner or a child with the guidance of a trainer to help ‘polish’ him for the show ring. Call or email for training update and or more info or pictures.